The best thing about having solar panels is you get to help the environment whilst saving on your electricity bills. It’s You and Nature’s WIN/WIN scenario. However, dirty solar panels can affect the flow and capture of sunlight. This with then, in turn, reduce the amount your solar panels are effective, hindering your environmental contribution. Not to mention the reduction in saving face. However, for every problem, there’s a solution. The Sunshine Coast solar panel cleaners at Pure Sunshine Solar Cleaning is the team for you. From Solar Hot water to hundreds of solar panels, they can clean just about anything solar. How Do I Get Back My Solar Panel Savings? You will see your savings return once you have your solar panels cleaned. The grime and dirt that is covering your panels is the reason for the sudden drop in solar productivity. The solar panel construction is based on electrons being moved away from the protons. The sunlight passing through the panels face is what’s causing this to occur. If the panels are dirty, grimy or otherwise covered, you will have less or no energy production. This is the reason why Pure Sunshine Solar Cleaning was founded. They help millions of Australians get their saving back whilst continuing to help the environment. Now that you are more aware of the reason for your savings going down, you may be tempted to get up there. However, solar panels are extremely delicate because their face is made of super thin glass. The wrong amount of pressure from an inexperienced cleaner can cause irreversible damage. Because of the fact that solar panels are expensive to replace, do yourself and your pocket a favour. 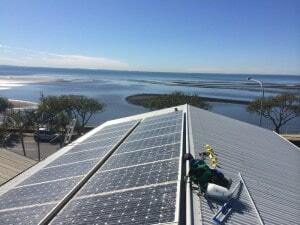 Get the Sunshine Coast solar panel cleaners in. Pure Sunshine Solar Cleaning is the company full of expert solar panel cleaners. Contact Pure Sunshine Solar Cleaning for your free quote and book in today.